Dom had a bug, a vomiting bug. A keep no food down-create 2 full laundry loads a day-be totally lethargic bug. It broke my heart to see him muster enough energy to take his bottle or chew a bit of dry toast only to bring it all right back up. This went on for 4 days, until he ended up in the A&E department on a drip to get some fluids into him. Now he’s by no means 100% yet, but he’s keeping stuff down now, and this morning, eating our porridge together was the sweetest sight. He’s sleeping like a fiend right now, and I’m still counting myself lucky that we only had to visit the hospital for a minor reason. They let us go home after he was on a drip for 3 hours. It was remarkable the change in him. What swung them towards letting him go home was his reaction when he saw us eating toast. 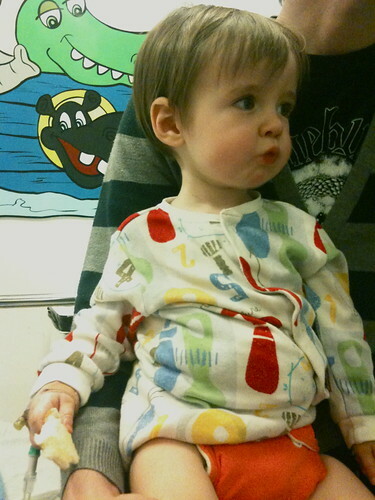 The doctor saw him wheedle some of his dada’s slice and declared him well enough to leave. Oh, poor guy! Glad to hear he’s doing better– hope he continues to improve. We’ve been lucky so far, only one little fever after a vaccine, and it didn’t seem to bother Mae much. Oh poor monkey 😦 Glad to hear he’s on the mend! Poor Dom. And poor you, how worrying that must of been. Glad he’s on the mend and thank goodness for toast! Oh poor Dom! So glad he’s doing much better now!